Pocket Ideas, what is it? So if a person with dementia or carer wanted to know what to expect when being introduced to “pocket ideas” what would I say? ‘Pocket Ideas’ is a portable pocket sized book filled with prepared activities and inspirational quotes to help stimulate conversation. 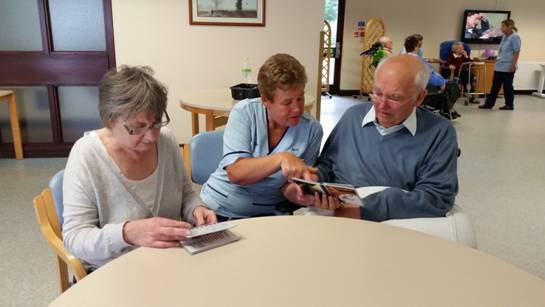 These conversations can take place whilst working with a patient in the ward, as the book is very portable, or in a group situation. It’s an opportunity for us all to remember to see the person who has had many life experiences, skills and knowledge. It helps to build therapeutic relationships, reduce distress, reinforce the benefits of meaningful activity and person centred care. It’s a tool that anyone can use and anywhere, reminding us that every moment we have to offer older people in meaningful experiences is valuable, and essential in our professional practice. Enjoy the experience using it and the opportunity to reminisce, remember and even talk about new topics. 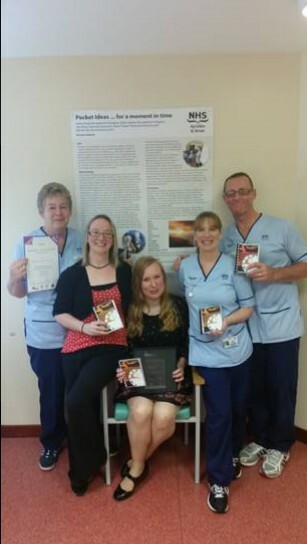 I would also tell them that this initiative won an award last year, in the category of “Best Acute Initiative” of Scotlands Dementia Awards 2014. Only takes 5 minutes to have a moment in time with an individual, and it reinforces the importance of meaningful activity. Simple prepared activities and inspirational pictures to stimulate a conversation. Encourages positive therapeutic relationships and reinforces the importance of humanity, compassion, person centred care and being actively engaged. Portable pocket sized tool and can be used anywhere by anyone. Enjoy using it, as a moment in time can bring back a memory, reduce stress, provide comfort and make you smile. Understand what the problem is and creative ways to address it. Importance of engaging relevant staff members to support project ideas. Establish a working group to talk about ideas, set achievable goals and support each other to realise a possibility and make a difference. Create a prototype using creative ideas. Develop a means to measure the benefits of using the prototype and then pilot the project idea in the relevant area. My top recommendation to make something happen, surround yourself with a great team. Our team picture includes; left to right Jean Knox, (Technical instructor), Gillian Agnew (Occupational therapists), me in the middle, Elaine Tizzard (Technical instructor) and Darrell Line (Technical instructor). I am currently on secondment and leading up the project ‘Pocket Ideas…for a moment in time’. I have been an Occupational Therapist for many years, but this is such an exciting opportunity to continue with the development of our person centred tool with the support of my ‘Activity Team’. 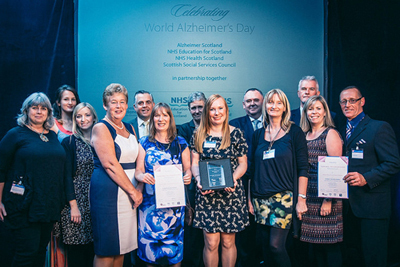 On Thursday 25th September 2015, in celebration of World Alzheimer’s Day, six winners of Scotland Dementia Awards were announced. The Awards are a partnership between Alzheimer Scotland, NHS Education for Scotland, NHS Health Scotland and Scottish Social Services Council. They provide an opportunity for professionals and communities, who are committed to enhancing the health, well being and experience of people with dementia and their families, to have their work recognised and promoted. The award scheme helps showcase the creativity, innovation and dedication that make a real difference to the daily lives of people with dementia and their families. It aims to demonstrate clearly how, across Scotland, policy is being sustainably put into best shared practice. All the work of the six winners can be viewed following this link. The Home Based Memory Rehabilitation Programme (HBMR) is an evidence-based occupational therapy, early intervention programme for people with dementia. The aim of this programme is to help people with dementia to compensate for memory difficulties that affect their everyday function, resulting in reduced demands on caregivers/family/friends. Based on the work of Mary McGrath (McGrath & Passmore, 2009), this 4-6 week individualised programme has been tailored and piloted in NHS Dumfries & Galloway. Positive findings include an increase in number of memory strategies used and a decrease in number of memory problems reported. Overall, participants have reported feelings of increased control. The work is captured in this two minute clip. How can we share AHP evidence based “award winning” practice enabling more people living with dementia to have access to these programmes of work? What other work is there that could be award winning? In this week’s blog we are delighted to share with you, during World Alzheimer’s Month, the first in a series of three reports sharing examples of the innovative work that allied health professionals are doing in Scotland to support people with dementia, their partners, carers and families. You can source a copy on our community of practice by following this link. The second publication will be shared on the 22nd September, the day after Worlds Alzheimer Day, and is called “Allied Health Professionals Delivering Post- Diagnostic Support: Living Well with Dementia. Our photo gallery captures some our key partners who have supported this publication. We would love to hear your comments on the first publications and our photo gallery.